Following on from the previous post I have modified my RC Design Functions spreadsheet to incorporate the US ACI 318 design code requirements, as well as the recent revision to the Australian code, AS 3600. The revised spreadsheet will be uploaded in a few days after further testing. The concrete stress factor applicable to the rectangular stress block is the same (0.85) in both codes for concrete up to 50 MPA, but in ACI 318 the factor remains constant for all concrete grades, whereas it reduces to 0.7 for 100 MPa concrete in AS 3600. The strength reduction factors are slightly higher (i.e. less reduction) in ACI 318 than AS 3600, and ACI 318 has different strength reduction factors for helical and rectangular ties, in compression controlled sections. 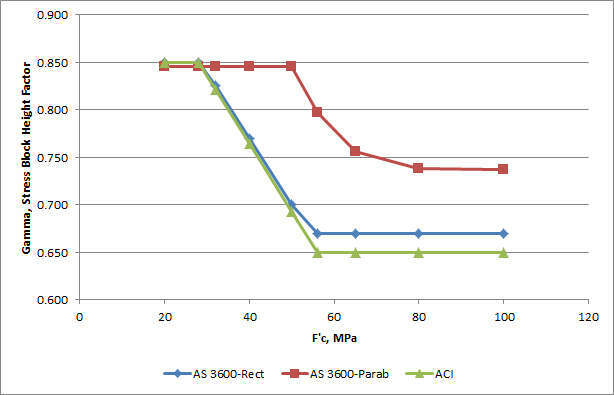 The transition from the tension controlled stress reduction factor to the lower compression controlled values is controlled by the axial load in AS 3600, and by the tension steel strain in ACI 318. 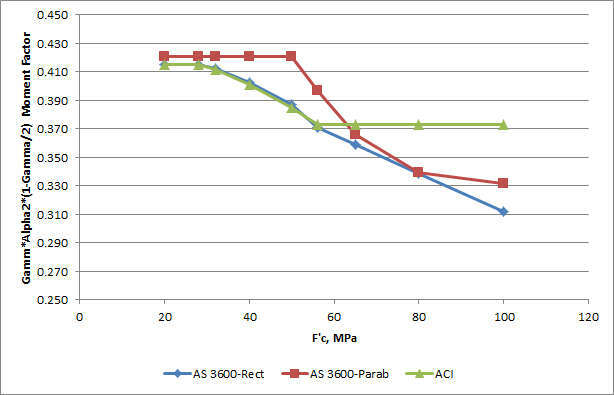 The result is that the factor starts to reduce at a much lower axial load in AS 3600 than in ACI 318. ACI 318 applies an additional reduction factor to concrete stresses for sections under uniform compression, as an allowance for unspecified load eccentricity, whereas AS 3600 specifies a minimum eccentricity. The combined effect of variation in the two factors is shown in the graphs below. The product of Gamma and Alpha2 is proportional to the force per unit width, and is referred to below as the Force Factor. The product of the Force Factor and (1 – Gamma/2) is proportional to the moment per unit width, and is referred to the Moment Factor. 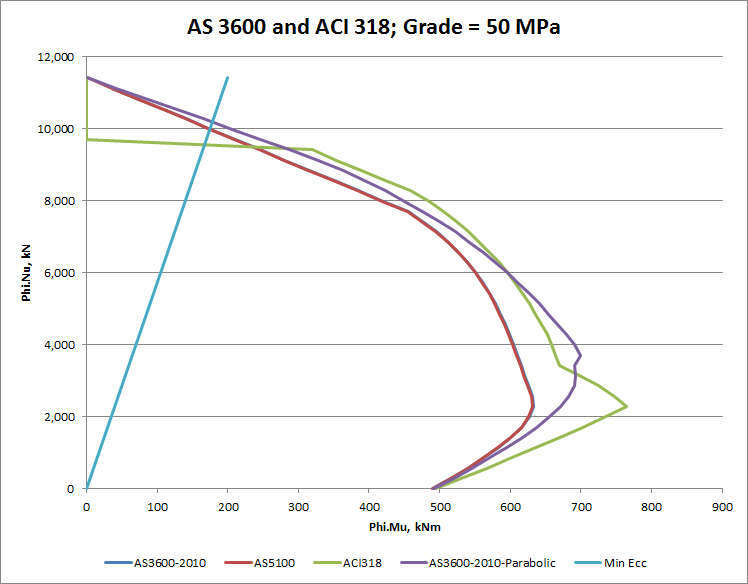 It can be seen that both factors are in close agreement for the two codes up to 50 MPa, but diverge significantly for higher strength grades. 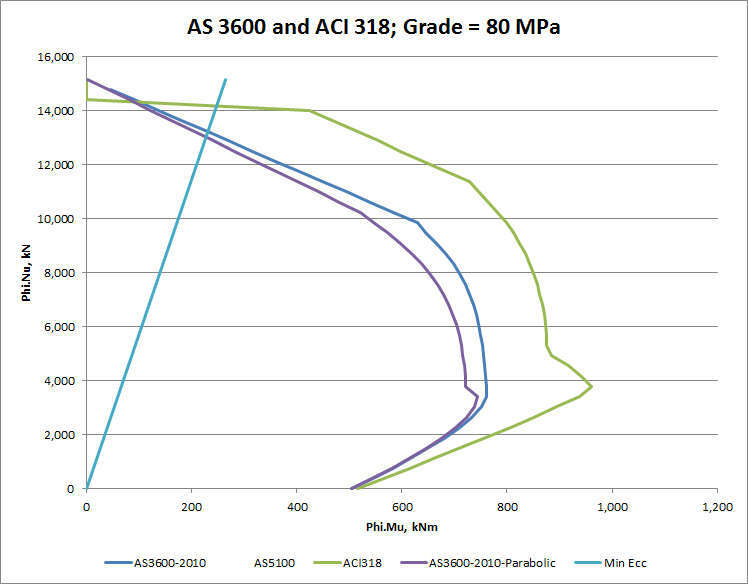 The curves for the parabolic-rectangular stress block are significantly different for the lower strength grades, but closer to AS 3600 for higher strengths. The different concrete stress block factors have little effect at zero or low axial load. The differences in the method of calculation of the strength reduction factor (phi) in the transition from “tension controlled” to “compression controlled” sections results in AS 3600 being significantly more conservative for axial loads approaching the balance load. 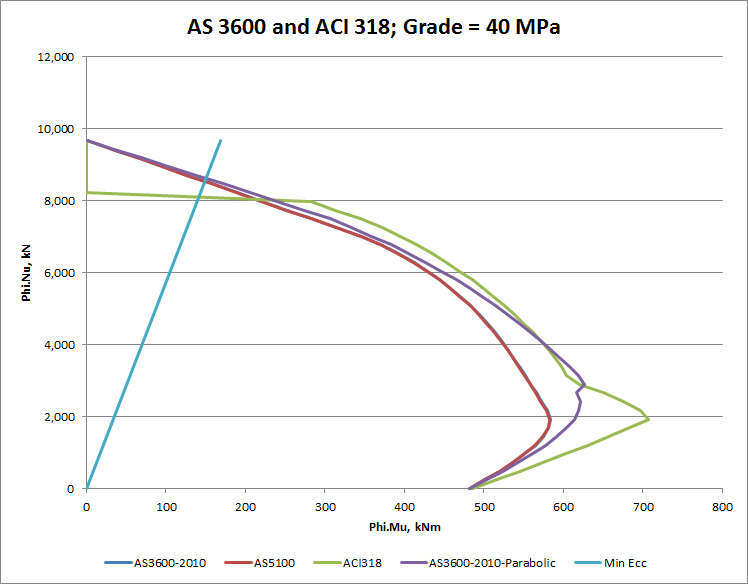 For higher axial loads the results of the two codes are similar for strength grades up to 50 MPa. 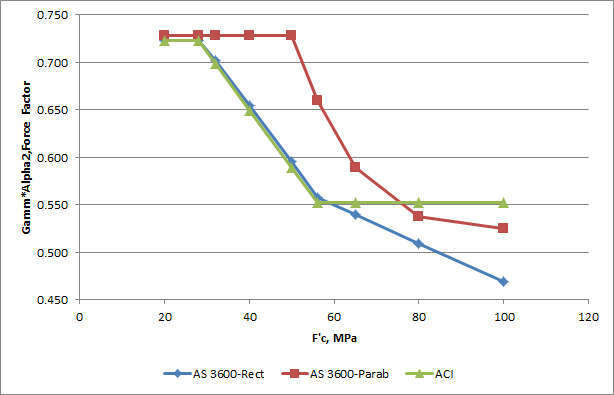 The ACI code gives slightly higher values than the AS 3600 rectangular stress block (because the strength reduction factor is higher), but the results from the parabolic stress block with AS 3600 factors are very close to the ACI values. 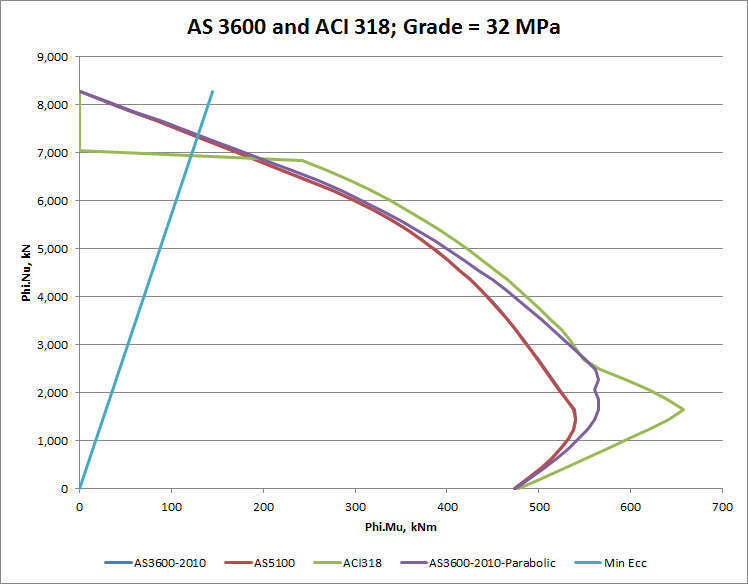 The maximum axial load in AS 3600 (controlled by minimum load eccentricity) is a little higher than the AVI 318 value (controlled by additional reduction factor) for strength grades up to 50 MPa. 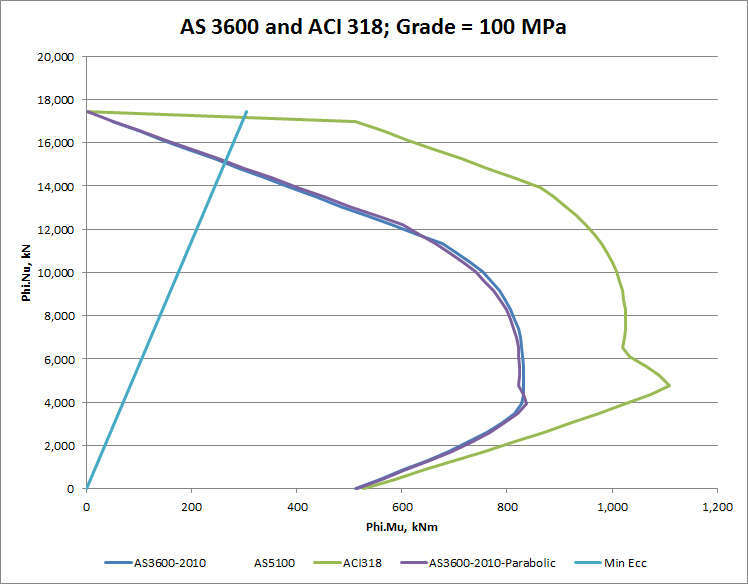 For strength grades above 50 MPa the compression controlled strength from ACI 318 becomes progressively greater than that found in AS 3600, with either the rectangular or parabolic stress blocks. 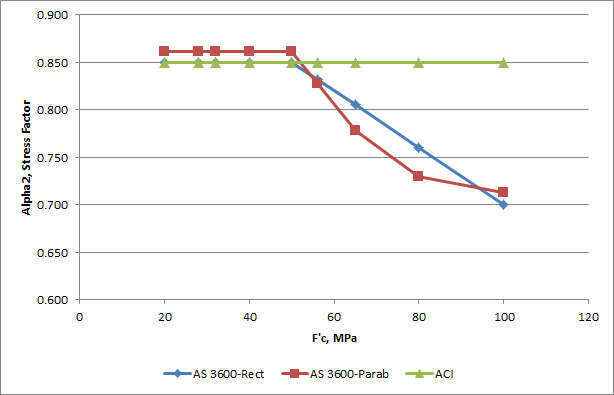 This difference is due to the constant concrete stress factor used in ACI 318, compared with a reducing factor for the rectangular stress block in AS 3600, and the reduced ductility in the parabolic-rectangular stress block data in Eurocode 2. The ACI code therefore appears to be unconservative in this respect. 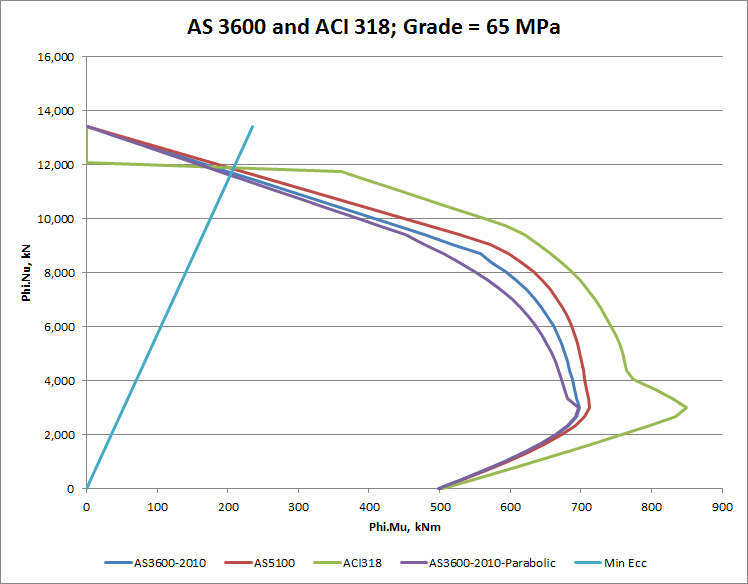 The rectangular and parabolic stress blocks used for AS 3600 give almost identical results at 100 MPa, but the parabolic stress block gives slightly lower results for concrete grades of 65 MPa and 80 MPa. The rectangular stress block may therefore be slightly unconservative for high axial loads with these strength grades. The next post in this series will compare AS 3600 with the Eurocode 2 results, and the two UK codes for concrete in buildings (BS 8110) and bridges (BS 5400). This entry was posted in Beam Bending, Concrete, Newton and tagged ACI 318, AS 3600, Concrete, Reinforced Concrete, Section Analysis, Ultimate capacity. Bookmark the permalink. Hi – I live in the UK and my name is Robin Atkinson. I find the above to be very interesting. I have developed a very sophisticated BS8110, BS8007, EC2 and CIRIA C660 design and teaching spreadsheet which you may wish to use in your comparison studies. Download via http://www.hac.idc5.co.uk/hacrc/Info.htm	There is also a pdf of the whole 103 page document. This is used by some leading UK consultants and I lecture on the subject in the UK. I plan to include AS 3600 and AS3735 and I hope to visit Australia in December. I am happy to collaborate on this.